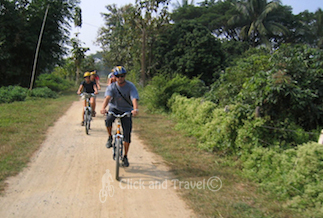 This cycling trip focuses on the rural Thailand and experiencing the local people who mostly work in agriculture. It starts outside the city and continues on carefully selected roads. 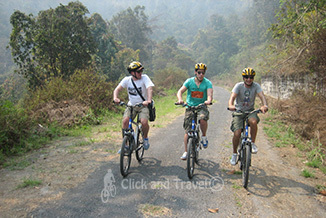 It's the perfect match for those who have ridden one of our tours south of Chiang Mai before. 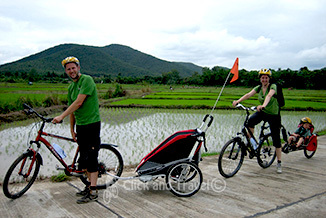 Less experienced riders and families with (young) children will have no problem riding this tour. You will be picked up from your hotel as scheduled and brought to the starting point of the trip outside the city. After a short briefing we start our exploration of the Thai countryside. 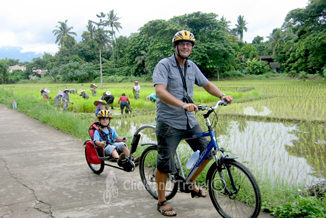 Our trail goes on quiet roads and stretches along rice fields, canals, orchards and farmland with a huge variety of crops. In some of the villages, it seems like time has stood still for many years. 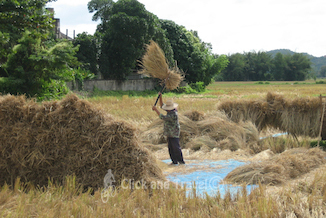 People are still farming the land according to old traditions. On our way, we visit some small scale projects. One of them is a local anthropological museum. We will make regular stops so that you can get acquainted a bit more with the local population and its culture and get a good image of the diversity of the rural, "real" Thailand. After the tour, you will be picked up and brought back to your hotel. Approximate duration: Around5 hours including transfer and frequent stops. Distance: Around 25-30 km, mostly flat. Category: Leisure cycling, average condition, families with children. 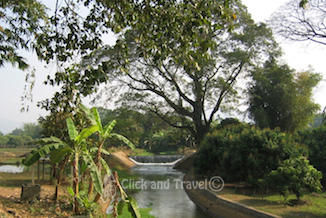 Key features: Thai rural life, orchards, rice fields, and anthropological museum. Included: English speaking guide, comfortable bike with front suspension, helmet (mandatory), local insurance, light lunch, snacks and bottled water. Bicycles: Adapted mountain bikes, also known as comfort bikes, with 24 gears and front suspension are used for their multifunctionality and comfort. The bikes are equipped with water bottle carriers but without racks. Bicycles for both men and women, in different seizes, are available. 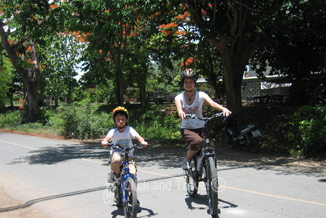 We also have equipment suited for young children such as children's bike seats, a bicycle trailer, trailer bikes with 6 gears and children's mountain bikes with front suspension and 21 gears.